That’s the story I’m going with today and if Ian Somerhalder and Nina Dobrev don’t state otherwise then I’m just going to keep believing it’s true. This couple is just to damned taciturn for me! They need to tell us if they’re still together or not! Don’t they have any decency – any regards for our feelings in the matter? Even Kristen Stewart and Robert Pattinson deign to go out in public and put on a united front some of the time. 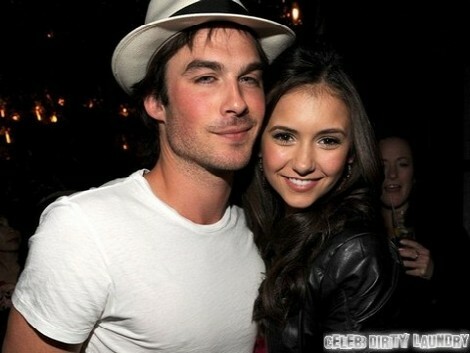 And Ian and Nina are lobbying hard to be the next Robsten. So what gives? Did Fifty Shades of Grey manage to break them up for good? Did Twitter reveal all last week or is this couple just very good at playing it very close to the vest? It’s not unheard of you know. Look at Angelina Jolie and Brad Pitt. When they don’t want to be seen then they are not seen. Same can be said for Gwyneth Paltrow and Chris Martin and Jay-Z and Beyonce. These stars don’t have to be in our face all the time. The famewhores just ruin the illusion for everyone. It surprises me that Ian and Nina are not famewhores. Ian’s a twitter freak but his gorgeous (though creepy) mug isn’t everywhere and anywhere. I can be down with that. So maybe we shouldn’t jump the gun. So the couple has been spending time apart. So we haven’t been able to track their every move. What does that matter? Maybe they are one of the few who actually value their relationship and its privacy. Maybe they are intent on the Hollywood game not bringing them down like it has to so many before. Are we in agreement? Are Ian Somerhalder and Nina Dobrev together again or were they never over to begin with? Also, do you think this cat and mouse game they play with the media is just a way to keep people interested in the CW co-stars? Has Hollywood made me too cynical? Ian Somerhalder Licked, Kissed, and Fondled by Casey Wilson: He’s Cheating on Nina Dobrev?